Baking Sugar cookies for Christmas joy. One of my favorite days of the year, is making Sugar cookies with my granddaughter Cora. She is almost 3, and this year we had lots of fun. We use an old family recipe for the sugar cookies, then make up white icing to smear on the top. Then the art work begins, she loves to sprinkle them with colors, and of course a few go in the mouth along the way. ( We keep these just for us, ha)! There seems to be so many traditions around the holidays, and for me, this one day of playing, baking and decorating cookies with her has become a tradition that I hope to do for many years with her. After decorating, we made paper ornaments to put on the windows and tree. Her favorite this year, is cutting out Christmas trees, in of course various sizes and shapes of her 3 year old creativity. We hope that each of you have special traditions, and share them with friends and family. Here, is wishing each of you all a Very Merry Christmas and the most blessed of New Years. 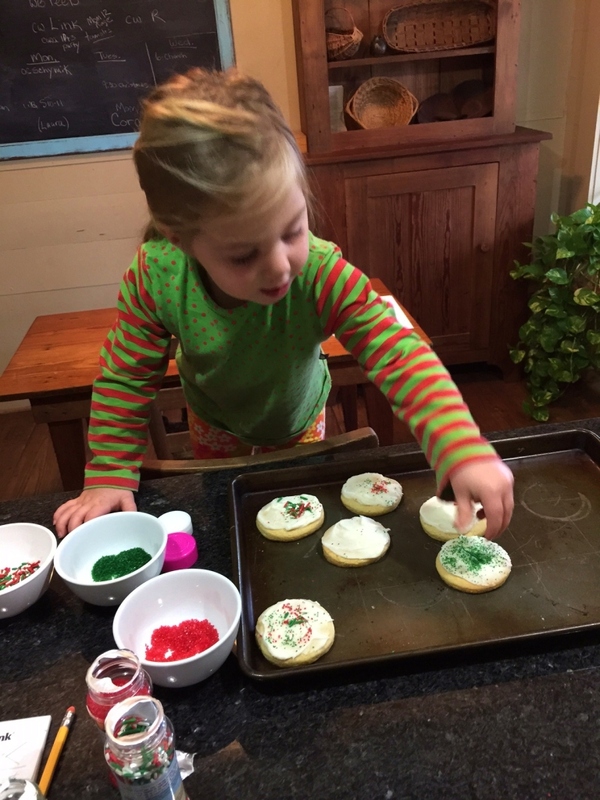 This entry was posted in Deb's Doodles and tagged baking sugar cookies, Christmas traditions by admin. Bookmark the permalink.